Ask any woman who has given birth if she has experienced SUI and I’m positive that the vast majority would say, “Yes.” SUI stands for stress urinary incontinence and 35 million women experience SUI, which can be triggered by ordinary day-to-day things like, coughing, sneezing, laughing, and even exercise. We should not have to live in fear of peeing when we sneeze or laugh. Laughter is a wonderful thing, and important thing, in fact, and should not have to be avoided. With Poise Impressa Bladder Supports you can laugh as much and as hard as you want to without worry about leakage. Another thing that Poise Impressa can help me with is jumping on the trampoline. My son, since he was a toddler, loves jumping on the trampoline. He also loves it when I jump with him. I quit a long time ago jumping on it, though, because I just didn’t want to pee a little on myself every time I jumped on it with him. My son finally quit asking, but it made/makes me sad that he just got tired of me saying no every time. 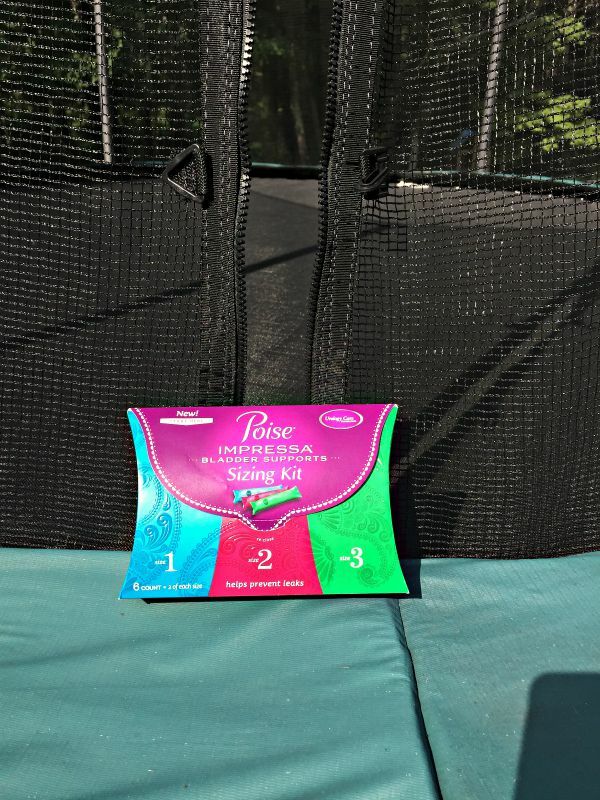 With Poise Impressa I don’t have to worry about stress urinary incontinence and can jump when I want to jump on the trampoline… even when my son doesn’t ask. It feels good to have that freedom.Designed for the temporary management of Stress Urinary Incontinence, Poise Impressa Bladder Supports do not absorb leaks — they help prevent them. Stopping leaks starts with the Impressa Sizing Kit. Impressa comes in three different sizes, and the Sizing Kit helps you find your most effective and comfortable internal fit. Each kit includes six bladder supports (two of each size), along with a $4 coupon toward a 10-count Single-Size Pack of Impressa. 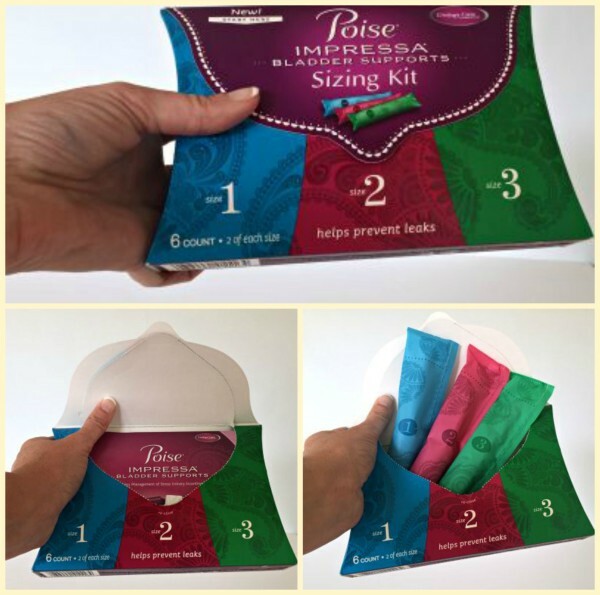 After you’ve found your perfect fit with the Impressa Sizing Kit, it’s time to purchase a Single-Size Pack. Each includes 10 bladder supports in your size — and you can use Impressa for up to 8 hours every day to help stop leaks before they happen. Right now Poise has a $2 off coupon on the Impressa Bladder Supports Sizing Kits. What better way to try impressa on for size and you’ll know exactly which single-size pack you’ll need to buy. Okay, I decided to do a giveaway! The winner will get a $10 Amazon gift code! Open to U.S. residents 18+ older ONLY. Giveaway ends October 2 at midnight. Enter on the Rafflecopter form below. Good luck! I learned that Impressa is for bladder leaks. I learned how impress works. I learned that Impressa is for bladder leaks and comes in different sizes. I learned that Impressa is safe and easy to use! I learned impressa is for bladder leaks, they come in different sizes, and they prevent leaks before they happen. I learned that you use it like a tampons, but it’s totally different. I learned that its not a pad or tampon but it works by compression and it works. I learned how Impressa actually works! Neat! I learned that I’m not alone in this and that there is an easy way to combat SUI and enjoy life again. I learned impress are for leaking bladder. I learned that Impressa is Safe & Easy to use! It comes in two sizes and you can wear it for up to 8 hours.